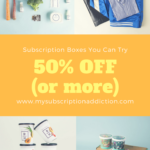 Check out the latest BuddhiBox News on My Subscription Addiction! BuddhiBox Mystery Boxes – Available Now! BuddhiBox Flash Sale – 40% Off Mystery Boxes!